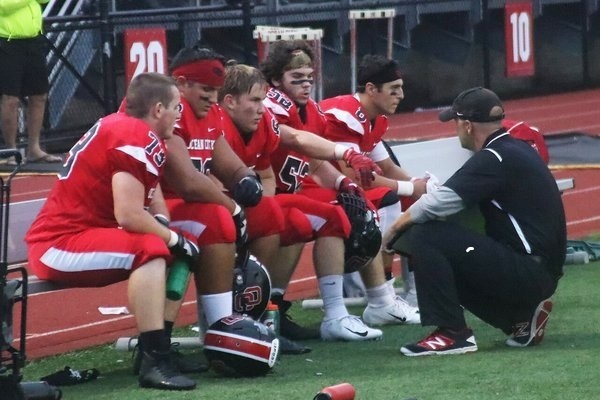 Ocean City High School’s Head Football Coach Kevin Smith, shown talking to his team during a 2018 game, is typical of folks who think New England will win, but who is not happy about it. It’s almost time for Super Bowl LIII, which unfortunately means that as of approximately 10:30 p.m. Sunday night, we will no longer be able to call the Eagles reigning champs. That fact, coupled with the disappointing way in which the Birds were eliminated from the Divisional Round of the playoffs, the tainted and well-earned view of the League’s officiating, and a lackluster matchup of Patriots vs. Rams, has left most folks with a much less enthusiastic view of this year’s Big Game. With that said, Super Sunday remains an unofficial national holiday and most folks still have their opinions and will be tuned to CBS for the 6:30 p.m. kickoff. Shown is the Draft Kings Sports Book at Resorts Casino in Atlantic City. This year also marks the first Super Bowl that can be legally wagered on at Atlantic City casinos. 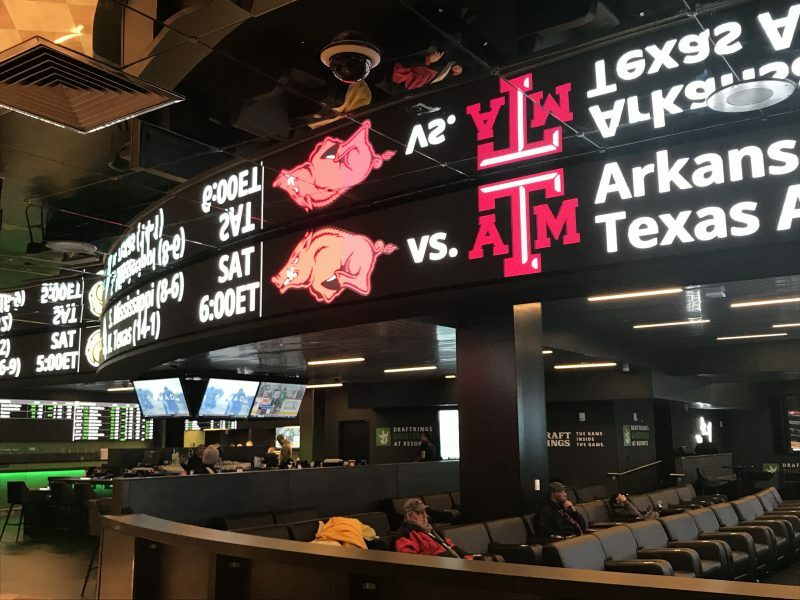 The new Sports Book at Resorts was doing a brisk business on Friday as fans laid down cash to secure their action on the game. New England, (11-5 in the regular season) is installed as a 2.5 point favorite at that time, and will be making a record 11th appearance. They can tie Pittsburgh for most wins (6) with a victory. On the other hand, a second straight upset loss might further tarnish the Pats’ legacy already sullied by the “Spygate” signal-stealing scandal against the Eagles in 2004, and the “Deflategate” fiasco in 2014-15, during which quarterback Tom Brady was accused of tampering with game balls in the Conference championship game against Indianapolis. 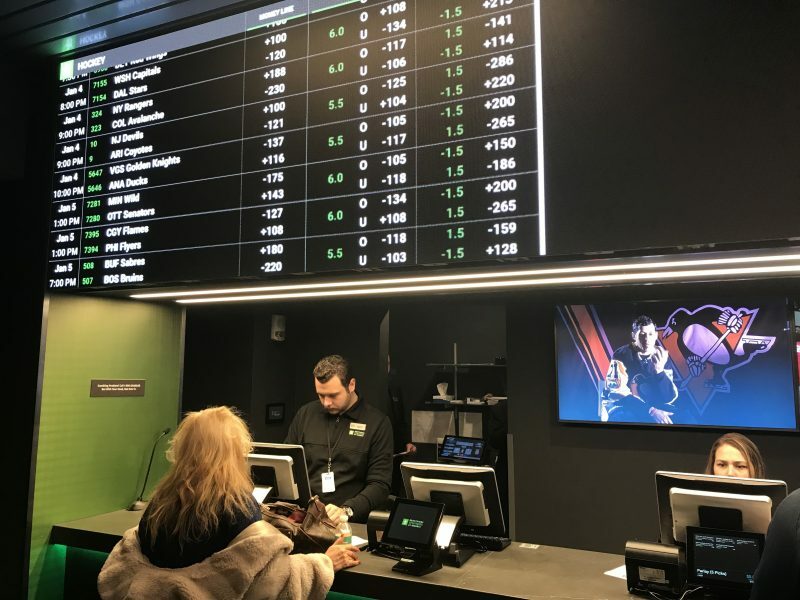 Legalized sports betting in New Jersey is happening for the first time before a Super Bowl. On the other side of the equation, the NFC representative Los Angeles Rams were the beneficiaries of one of the worst no-calls in league history in their Conference title game, which probably cost the New Orleans Saints a berth in tonight’s game. What’s more, the Rams are just a few years removed from their relocation from St. Louis, and don’t have much of a fan base. Despite all of this, local experts and fans were not shy about sharing their thoughts on the game. We reached out to some local folks and also solicited opinions via Facebook. 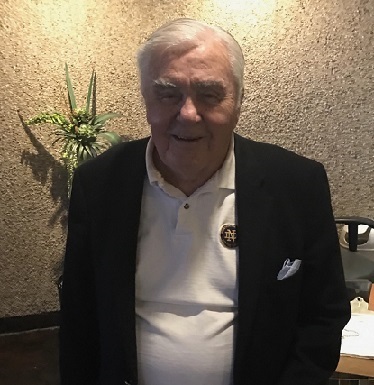 Bill Whiteside, of Ocean City, a national champion player at Notre Dame, could go 3-0 on his predictions for this website with a New England win. Ann Edmonds, Ocean City, via Facebook: Patriots. They are out for blood and don’t like losing fair and square, even though they cheat. Lee Wagner, former (Camden) Courier-Post sportswriter: Multi-dimensional Rams 31, no run game, suspect defense Pats 21. Bill McLaughlin, via Facebook: Sorry to say it but I see this game as a blowout win for the Patriots. Tom Williams, Ocean City broadcaster, sportswriter and Prime Events proprietor: Patriots. Tom Brady. ‘Nuff said. Ted Taylor, Philadelphia area radio talk show host: “Like 44 percent of the population, I couldn’t care less, likely won’t watch. Having said that, Patriots 42, Rams 12. So there you have it, our unscientific poll clearly favors the Pats. But who knows? Feel free to leave your own thoughts on our Facebook page.